Post number 5 in our summer series illustrating how libraries deliver against a wide range of outcomes. Shortly after the 25th anniversary of the World Wide Web, this piece focuses on digital matters: both access to online channels, and the skills needed to understand how to get the best out of the sites and services available. Being digitally capable can make a significant difference to individuals and organisations day to day. For individuals, this can mean cutting household bills, finding a job, or maintaining contact with distant friends and relatives. For organisations, going online can provide ways to reach more customers and reduce operating costs. The internet also provides broader benefits, by helping to address wider social and economic issues like reducing isolation and supporting economic growth. Public libraries provide a trusted network of accessible locations with free WiFi, computers, and other technology. As the world becomes more digital, access to technology and the ability to operate confidently and safely online are ever more important. A 2014 BT report estimated the value of digital engagement to a new user at around £1,064 a year, however in 2015, around 14% of the UK population still lacked household internet access. Digital gives people the opportunity to access services more easily, to learn, and to interact with others. It also saves them money: As the Lloyds Banking group digital index 2016 confirms, people on lowest income groups can save £516 per year by becoming online consumers. Digital skills also boost people’s employability, and the productivity and prosperity of the organisations they work for. Through the collective efforts of Arts Council England (who managed the funding announced in Budget 2015) and local councils, over 99% of public libraries in England had free and upgraded WiFi access in place for users by April 2016. Arts Council England have undertaken and published research into the benefits gained from its use. Trained library staff, supported by volunteers, help local people use online services covering areas like benefits, business, health and wellbeing. They can also provide the training and support individuals need to become independent users of digital services. And they don’t only help communities at a basic level - increasingly they offer ways for people to develop and use more advanced digital skills, through activities such as code clubs and facilities like makerspaces and Fablabs. The Society of Chief Librarians (SCL) have created a Universal Digital Offer: “This offer recognises that the development of digital services, skills and access underpins so much of a 21st century library service. As such, it supports and enables the delivery of all of the Universal Offers.” Read more about this offer on their website. It’s hard to sum this up in a short piece as the activities offered in almost every library are rich and varied. Most offer basic digital training, whether carried out by library staff or volunteers, or sometimes in conjunction with partner organisations (see below). We’ve blogged before about digital skills partnerships - and that post references the survey of libraries in England, Wales and Northern Ireland conducted by the SCL that indicated that up to 192,000 people were supported by almost half a million digital skills sessions across the library network in 2014-15. We’ve heard stories of people learning to use skype so they could read stories to their grandchildren on the other side of the world, or use social networks to trace friends and former colleagues. I’ll focus here on 2 library services: Leeds and Newcastle, as they have trodden new ground. Leeds first, who in March 2016, became the only library authority in England to be honoured at the National Coding Awards. The two ‘Highly Commended’ awards were in recognition of events held as part of National Coding Week 2015. You can read more about this in their blog. They’ve worked with Leeds CoderDojo to help design coding sessions for adults, and devised an activity called ‘Hour of Code’. 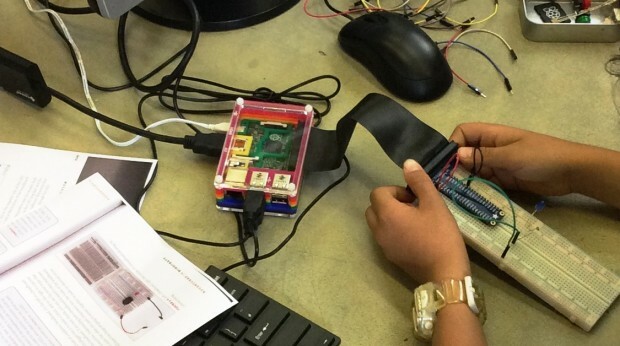 Besides Code Clubs, they offer sessions on Raspberry Pi and Minecraft Pi, plus practical digital sessions which are more about using tools than creating them. This booklet has more information about Leeds libraries ‘Discover Digital’ programme. Newcastle have a whole series of activities - which initially came to our attention via Aude Charillon and her work as a Carnegie Library Lab partner. Her project was to encourage members of the community to discover and use copyright-free works in fun and engaging ways, and educate members of the community on copyright laws and their digital rights. She blogged for us about the project and the data hack event it led to. The Libraries Taskforce is planning to release an open data set soon, and we are working with the team in Newcastle to learn from their experience. Besides data, Newcastle have also recognised that once people have basic digital literacy, they need to keep learning, and both library staff and members of the public need to understand more about cyber security. To explore this further, they held a CryptoParty (possibly the first in a public library?). Aude blogged about it, and is already talking about holding another. And in other libraries: last years winner of the CILIP Libraries Change Lives award was developed by North Ayrshire Council’s library staff. Read more about the project here and we’ll see if we can encourage them to write a post for us sharing their experiences since winning. Finally, SCL’s learning offer lead recently published a blog where she revealed that there are now 261 Code Clubs in libraries, and talked about lots of plans for development. Recognising that there is a need to support library workers to develop their skills so they are better able to support their community, the SCL have implemented a number of initiatives. They ran a digital leadership programme, and in 2014, produced a report on its effectiveness. They have set up a training programme which is available online and aims to ensure that people who work in libraries have the tools and skills they need to support library users effectively. 14,000 library staff have been through this programme - a large percentage of the total workforce. They also ran a session earlier this year to share good ideas and promote Code Green which is part of their learning offer. Darren Smart blogged about it for us, and Ben Lee published a set of images which illustrate the event. Halifax have developed a partnership with the SCL, and Halifax Digital Champions support library staff to provide free IT taster sessions in local libraries to members of the public. So far, the scheme has worked in partnership with more than 80 libraries and provided upwards of 200 hours of colleagues’ volunteering time and continues to add more libraries to the roster every month. Read more about it: Digital Champions sharing skills in libraries around the country. Tinder Foundation ran an event last week: Libraries Delivering Digital Inclusion - with 100 delegates talking about all things libraries and digital inclusion. They will write up the highlights for us, so look out for that post. We’ll also publish a post which shares some of the collaboration going on in Greater Manchester. We mentioned makerspaces above, we’ll write more in the future about what is on offer around the country and in particular the potential for people using them to create new businesses. Next week we’ll share how libraries contribute to improvements to health and wellbeing.